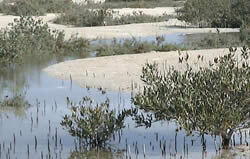 They provide shelter for numerous marine animals, fish, crustaceans and birds. Seagrass beds, all 11 species of them, are another form of plant life found in the Red Sea. Like mangroves, they protect the nearby coastline, but unlike mangroves, they provide both food and shelter for the creatures that call the Red Sea home: water birds, fish, and the endangered dugong and green turtles. Plant life must continue to grow to preserve the beauty that is the Red Sea. Contact us to learn how you can help preserve the Red Sea.